Motorcycle rider gear has come a VERY long way in the past few years. For my first cross country trips, “gear” consisted primarily of a helmet, gloves, hiking boots, and a ski parka. What would have happened if a high speed mishap occurred while wearing a ski parka? Not pretty. In 2014 riders enjoy a plethora of choices. When I go out for a ride today I’m wearing gear that cost more than my first motorcycle. In fact, more than my first four motorcycles. Added together! As with all quality gear, the assurance of comfort and greatly enhanced safety brings peace of mind at the start of the ride, and after all, isn’t peace of mind what many of us are looking for at the end of the ride? In short, the cost of quality gear is always worth it. Back in the day, a leather jacket and pants were the Mt. Everest of gear to aspire to, and many old coots still prefer them. As an old coot myself, I still wear my custom fitted leather pants whenever the weather is not too foul. For one thing, a custom fitted set of leather pants is a strong motivation to not gain weight. For another, you gosh darn look so cool, don’t you? Maybe. In recent years I’ve switched to a textile jacket all the time and textile pants for most of the rest of my rides. In fact, I own three textile jackets. There’s a long story of how I came to own three, but we’ll leave that for another time. They have so many advantages, but…and there always seems to be a “but.” With textiles, there are several such “buts,” and added together they make a compelling case for carrying a Nelson-Rigg rain suit with you on every ride. Most textile gear is advertised as being “water resistant.” You’ll soon learn the difference between “resistant” and “proof” on a ride of more than 20 minutes. Most textile pants and suits have what is termed (insert brand name) “crotch,” which can make arrival at your destination or office interesting, to put it mildly. Taking two minutes to pull on rain pants before the ride can save you the agony of many mildly embarrassed stares. The outright laughter as you explain yourself can be worse. Of course, it does not rain all the time. It just seems that way if you ride in the Seattle area. I’ve found that my leather pants will allow me to “cheat” for an hour or two. The cost of not spending the two minutes for the rain pants is the need for more frequent treatment of the leather with your choice of spendy cleaning and “feeding” goos and ointments. Oddly enough, this can vary with the motorcycle. I used to own a sport touring bike where, in a downpour, water would run off the tank bag and drip right onto the expandable panels at the knees. Soon I’d have rivers of refreshing chilled water running down into my socks. A rain suit is a better idea. All three of my textile jackets shed most of the water, but not all of it. Over time, the jacket and pants become sodden, and worse – heavy. I’ve had my textile jacket get so heavy it actually began to affect my ability to make rapid changes in the operation of the motorcycle. And then, when you take them off, they take much longer to dry, as in in days, than they did to get wet. Sometimes even hanging up overnight in a motel room is not enough. My record for drying time is three days! Worse, if the rain you’re riding in stops, you have a completely different problem. In the great state of Georgia in the summer, for instance, it rains for about 20 minutes every hour or so, and then stops. When it stops you are riding in 20 pounds of sodden gear that is evaporating, and suddenly you are cold. In some cases; extremely cold. To test this, wait for a windy day in your area. Put on jeans and a sweatshirt and stand in the shower for 5 minutes. Now go outside and stand in the wind. In just a minute or two you will struggle to get out the words “D-d-d-damn, that’s c-c-c-cold! Another factor is cleanliness. There are some who hold to the “I bought this bike to ride, not to wash” philosophy (which I always thought was just plain silly – and I worked for a BMW dealer!) and prefer to wash their bike and gear as seldom as possible, or not at all. This evidently makes you look more like a “real” motorcyclist. That’s not how I was raised, and I like a clean bike and a (relatively) clean me. When you ride in the rain your textile jacket absorbs a lot of road slop. This is not too noticeable on most riding pants, which are usually black and don’t seem to show much crud. My jackets, on the other hand, quickly turn toward the muddy gray band of the color spectrum. In particular, the neon green high visibility one looks like it was hit by a shotgun loaded with mud pellets. 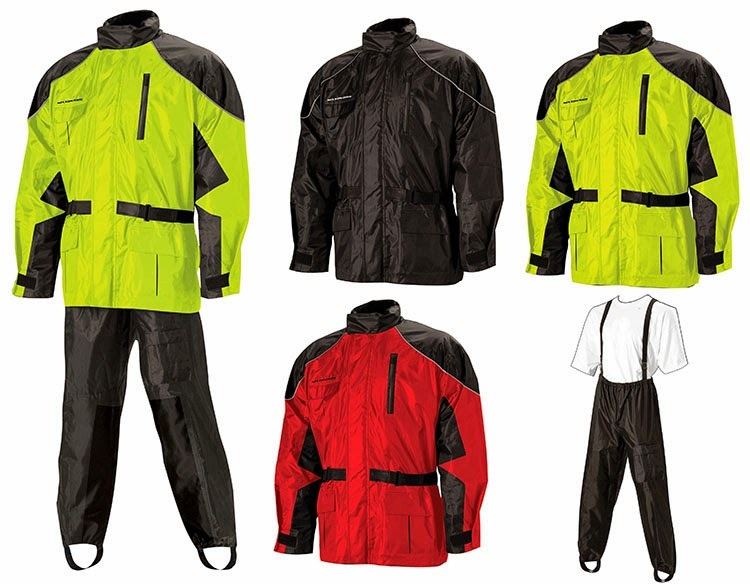 All of these issues can be resolved quickly and easily with a Nelson-Rigg rain suit, at a cost that makes them possibly the most reasonably priced gear available. You can purchase a two-piece rain suit for $40, which around here equals just a few daily visits to a Starbucks. Even the best Nelson Rigg rain gear is under $100. Even better, your rain suit can be rolled up and stored in virtually no space at all. On many motorcycles there’s enough room under the seat. For a few bucks more you can add some Nelson-Rigg Waterproof Rain boot covers for complete protection. And last, there’s the issue of cold. Whether on a short ride or a cross country jaunt, there will be times when Mom Nature decides to throw some cold your way that your gear and liner and shirt and sweater and whatever find more than challenging. Simple. As the rain gear is impervious to water, it also makes a fantastic wind block, and you’ll be comfortable for much longer at much lower temperatures. Endurance sports car racing teams spend a lot of time on something you might not think about – keeping the driver comfortable. They’ve found that a driver in a comfortable seat with enough heating or cooling, ample ventilation, and neck, back, and hip support, is much faster for a much longer stint, which is the whole idea. Very few things on a motorcycle will make you as miserable as being wet and cold. Such conditions sap your energy, and your brain spends a valuable percentage of its resources (your results may vary) thinking about how cold and wet you are and thus, less on what you’re doing and the rapidly changing scenario in front of you. Being comfortable, warm, and dry can literally make all the difference. With the price so reasonable, a quality Nelson-Rigg rain suit is a very cost-effective investment in the quality of your ride.